On the last day of field work on Kahoʻolawe, we collected bunches of pili grass seeds for out planting, like the older individuals we planted in Hakioawa the other day. Jamie explains that the seeds disperse a short distance by wind, and when wet, corkscrew themselves into the soil. 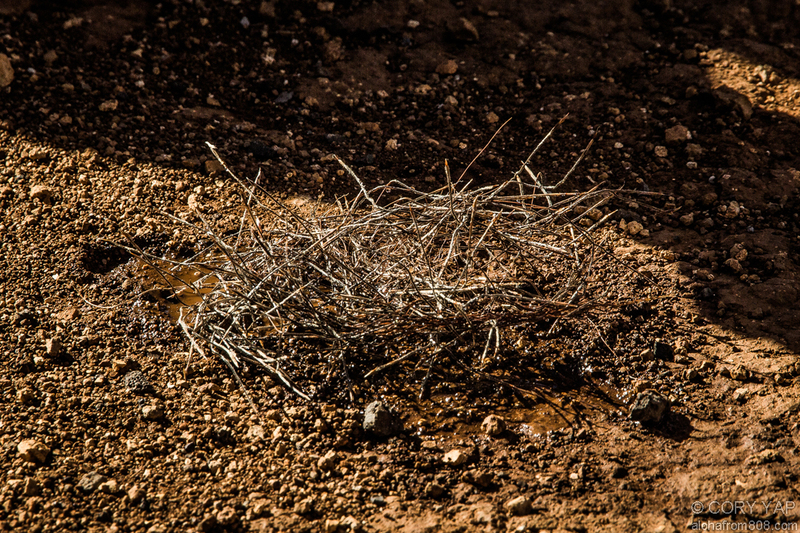 However, the hard pan makes it difficult for most plants to root in, and therefore most vegetation requires assistance from people to become established. 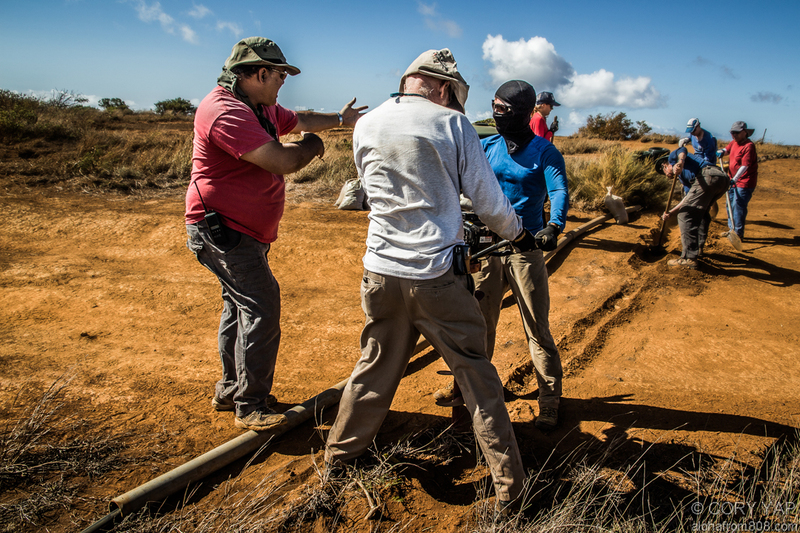 In one of the higher elevation areas on the island, we needed to install an irrigation pipe that would be seated under a dirt road. 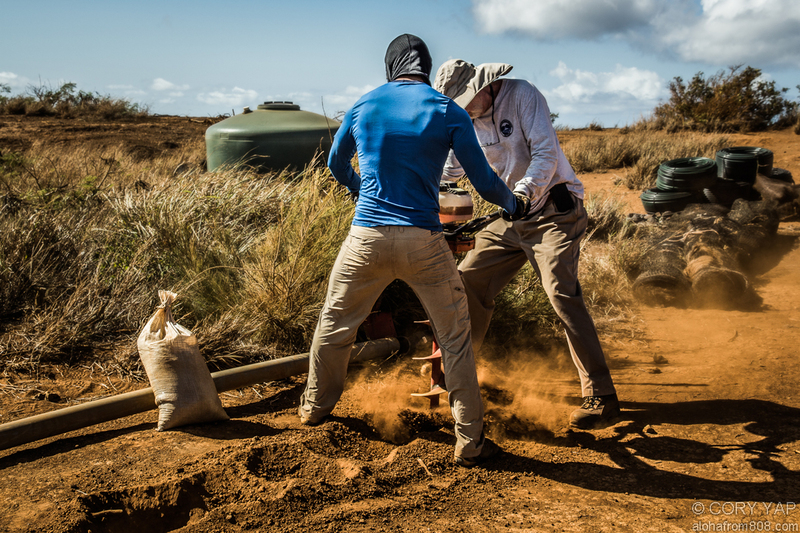 Using an auger (corkscrew drilling machine pictured), Chase and Patrick help loosen the hard pan for the crew to further open up the trench for the 4″ ABS pipe. With picks and shovels, the trench was chiseled about a foot wide and a foot deep. After seating the pipe properly, we refilled the excavated hole and wet the softened soil until all the air bubbled to the surface. The gravel bags we had again filled earlier were used to cover the remaining depression. We further compressed the bags down by walking on, then driving over them with our vehicles. 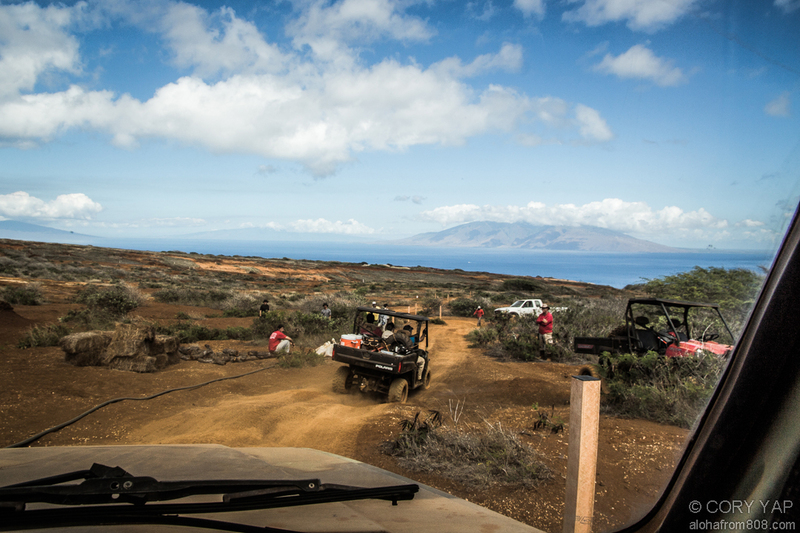 On our way back south, we were able to fill more gaps in the road with the remaining gravel bags from the trucks. 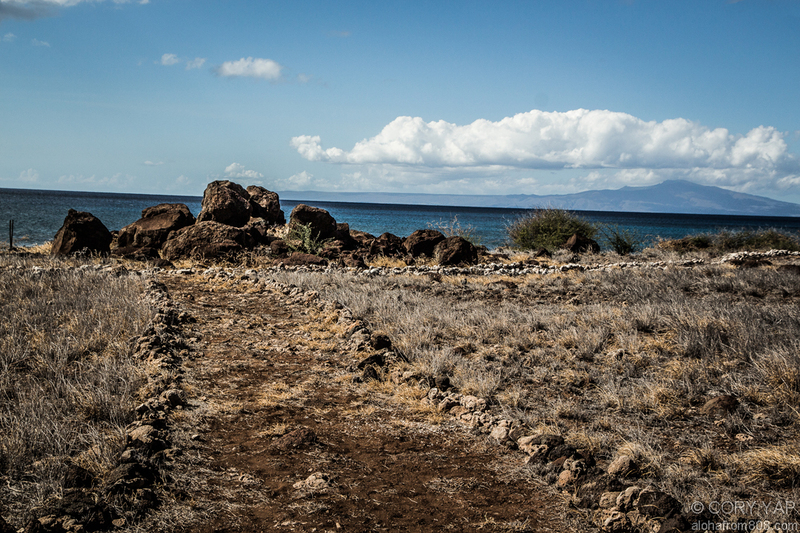 After the attack on Pearl Harbor in 1941, Kaho‘olawe was used as a bombing range until 1990. 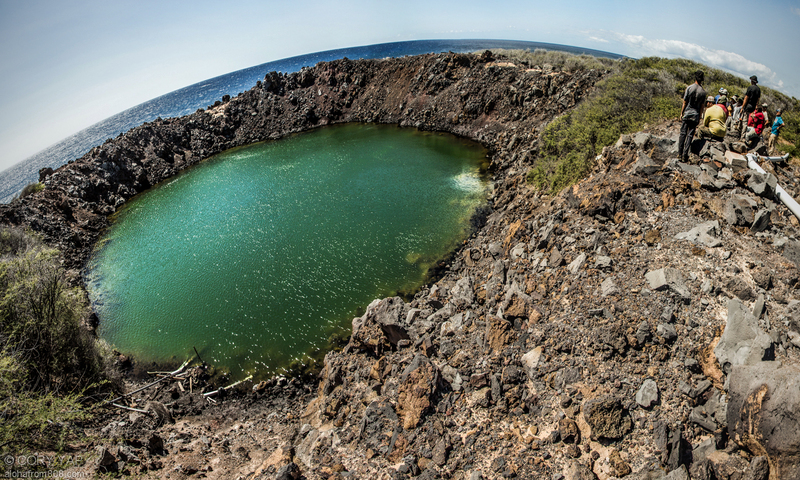 The coastal crater shown above, known as the “Sailor’s Hat,” is the remnants of a 1965 explosion by the U.S. Navy to determine the blast resistance of ships. In it were red shrimp, called ʻŌpaeʻula (Halocaridina rubra), that graze on the algae covering the the rocks in the pool, as well as many other anchialine pools in Hawaiʻi. As juveniles, the shrimp recruit to these coastal pools through underground cracks connected to the ocean. 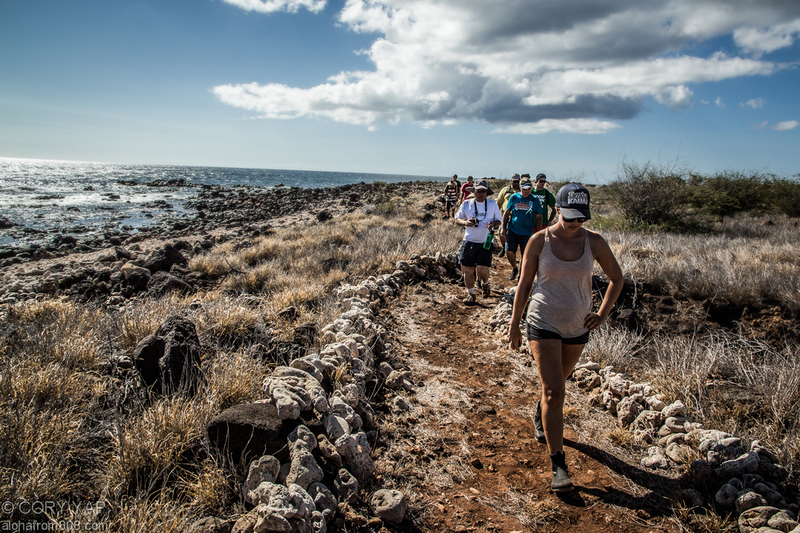 Afterwards, we regrouped at camp to do a coastal hike with Jen Vander Veur (one of the KIRC’s Ocean Resource Specialists), who would teach us about a coastal ahu, monk seals, and Hawaiian fisheries. 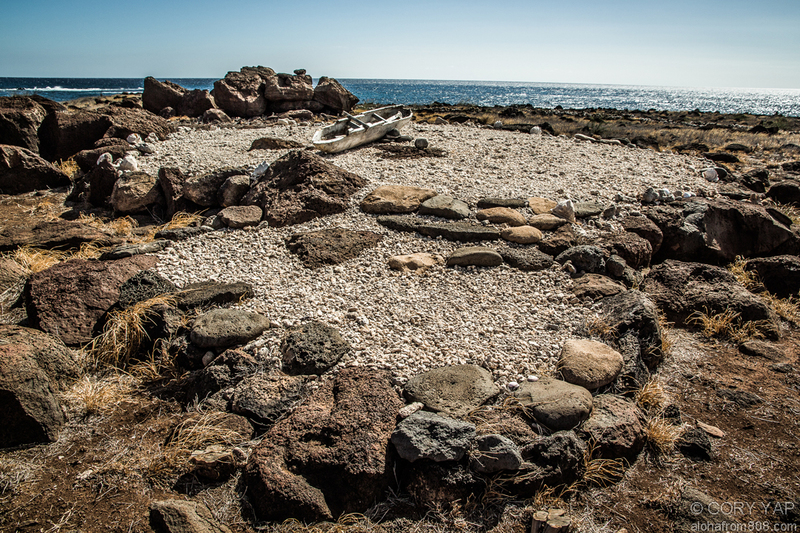 The ahu was located at the westernmost point of the island, called Lae O Kealaikahiki, which was supposedly an excellent learning, launching, landing and navigation point for voyaging canoes, including the Hōkūle‘a. Due to its positioning, it is said that this location offers the best and most direct route to Tahiti. 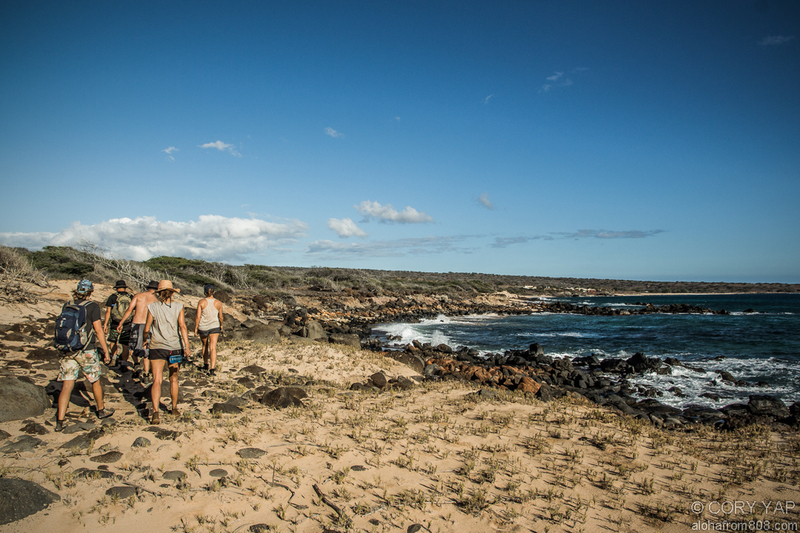 Hiking on to the next location, I could not help but notice how well kept the trail around the island. Stacked coral rock lined the path, and the ground was well compacted. Further down the coast we stopped at an area where several species of mollusk were studied and their shells collected. 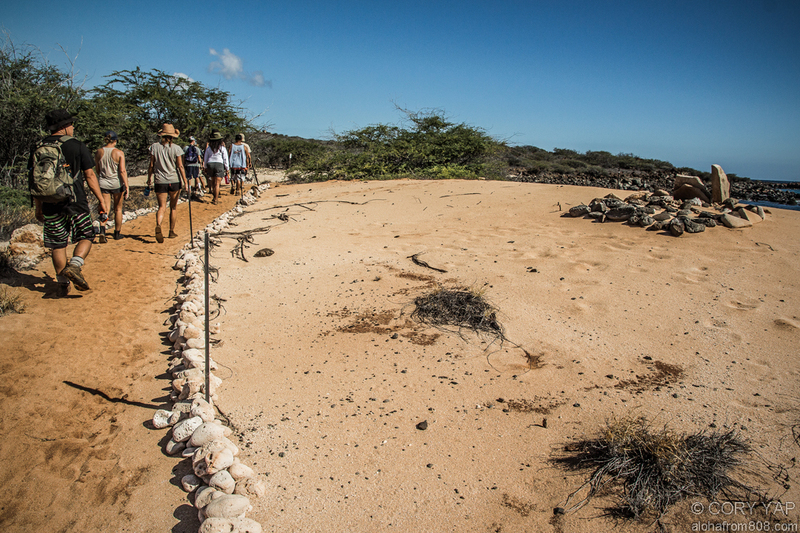 Though it is illegal to take any naturally occurring organism from Kaho‘olawe, some shells of species are taken for scientific documentation and surveying. 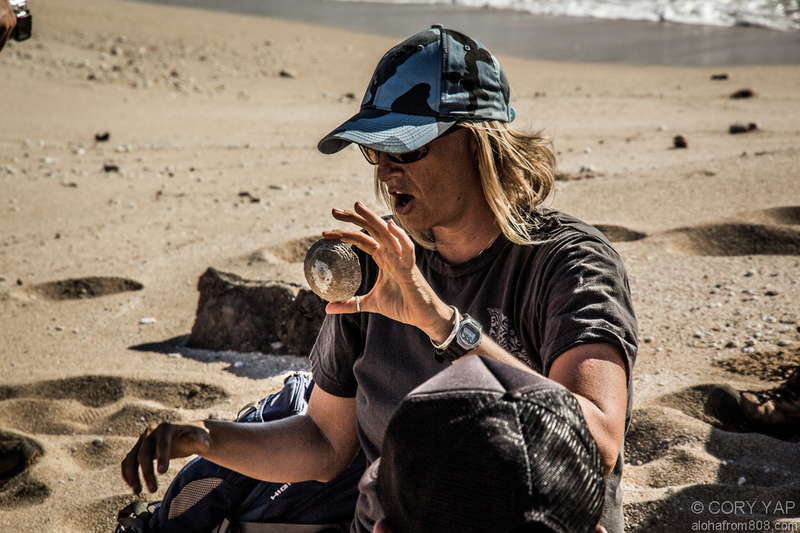 Jen then talked to us about sustainable fisheries, particularly about ‘Opihi and “mega-spawners,” or marine organisms which have the highest reproductive potential because of their size. 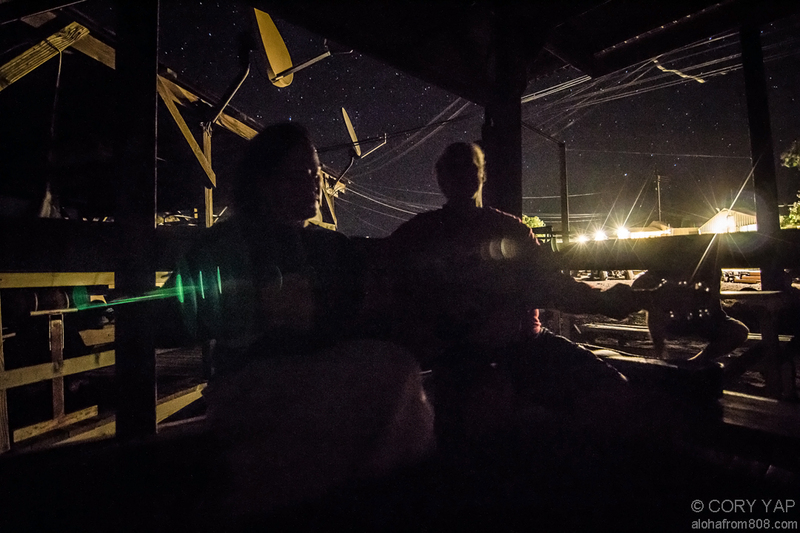 This concept has been well detailed in Hawaiian history and in scientific literature. In addition to not fishing juveniles in a fishery, it is important to not remove the largest individuals as well. These “mega-spawners” are the most fecund, and/or produce exponentially more gametes and the highest quality of gametes. This is because these individuals are larger, and can invest more energy into reproductive processes, rather than into growth. 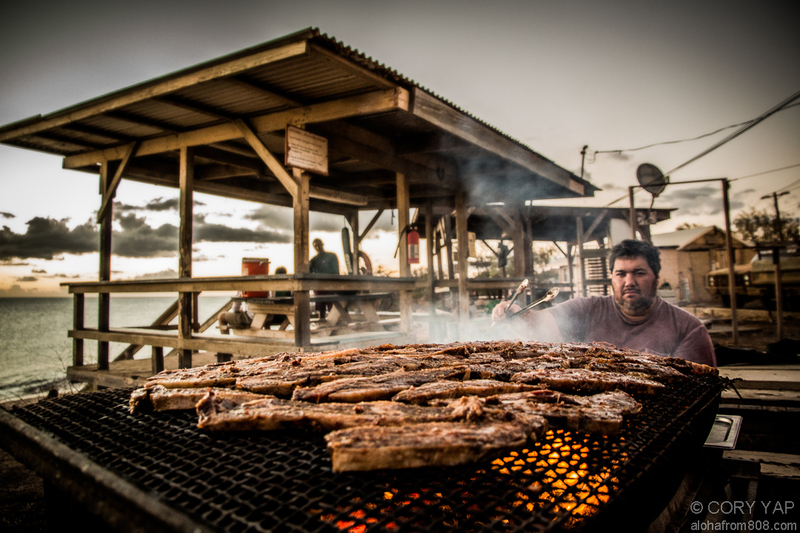 If everyone followed simple regulations, Hawaiian fisheries would be more sustainable. Unfortunately most fishermen do not value this concept very much, and often remove the largest and least common fish from populations, as they are the most desirable for sport or consumption (or commercial price). I keep hearing fishermen, particularly Oʻahu spearfishermen, say that there are still plenty of fish out there (#oahustillgetfish). However, what they do not realize is that their comparative baseline is not standardized. 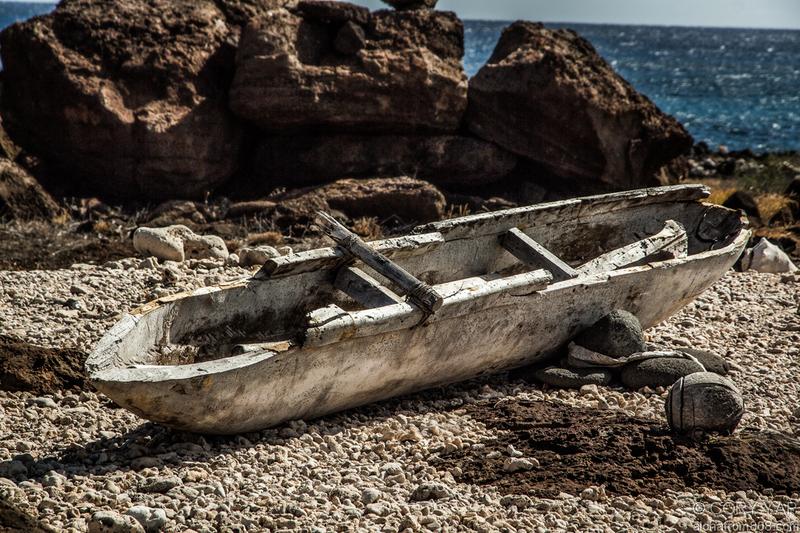 Better techniques, physical conditioning, fishing gear and geographic range allows fishermen to further exploit resources that were much more plentiful decades ago. I was planning on discussing this in further write-ups having to do with fishing/diving, but haven’t had much time to get in the water as much recently. Although boring and a potentially controversial topic to some, it is an important topic to both fisheries managers, researchers, local fishermen and consumers of locally caught fish. There is a lot more to say here, so I’ll save it for when I actually document other fishing techniques than those I already have. The coastal hike was not very long, and again I was stoked that we were able to get back to camp in time to go swimming. 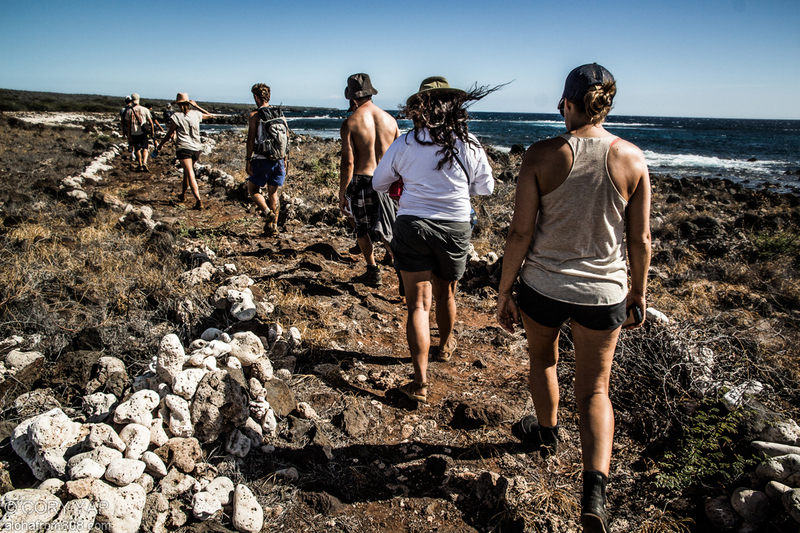 Unlike the previous two days where we had little restriction to explore, Jen strictly herded us like a cattle dog. I understand the how safety rules and liability are important, but I feel that they should be consistently practiced by all staff, and not others. If not, it would appear that each staff member could make up their own rules… The least favored rules may reflect negative opinions of the person who manifested the rule. On the other hand, if other staff members are not enforcing pre-designated rules, that might be equally disapproving by both staff and volunteers. 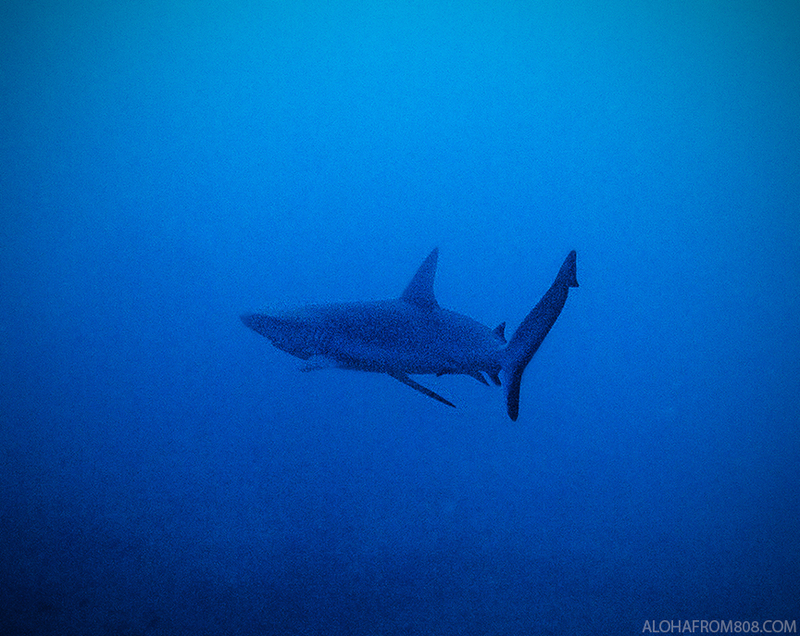 Anyhow, we were still fortunate during our swim to see a small blacktip reefshark or Mano Pa‘ele (Carcharhinus melanopterus), which I don’t commonly see back on Oʻahu. With kanikapila (kind of an impromptu jam-session) on the deck next to the ocean shortly afterwards. Listening to the staff and volunteers play guitar and sing some classic Hawaiian music was probably my favorite part of the trip. So much talent, and in such a special place! 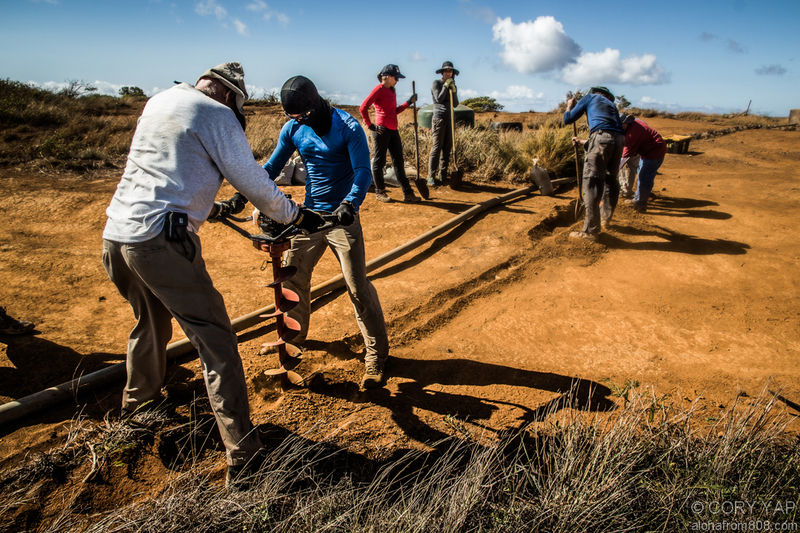 Getting such an intimate experience of Kahoʻolawe’s restoration, history and culture was one of the most rewarding experiences I’ve had while volunteering. Being able to have this experience with great friends, while simultaneously making many new ones, made this trip even more enjoyable. In addition, I was able to watch the sunset and moonrise everyday while I was here, which is something I have never seen in consecutive days before. With moonrises being one of my favorite landscapes to photograph, these events in itself are very special to me. So stoked to meet so many people and make many new friends! 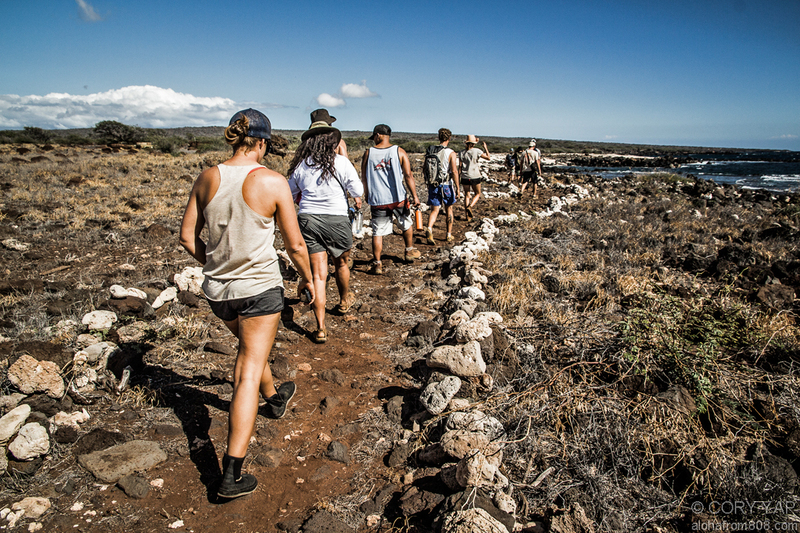 More questions about Kaho‘olawe or about my experience volunteering there?!? Just ask!!! Aloha and mahalo nui for visiting… Come back again soon!